The goal of microfinance institutions is to serve customers that are otherwise not serviced by the commercial banking system. Microfinance providers have challenged convention and achieved rapid growth in scaling to reach 211 million customers worldwide in 2013. However, although growth has been significant, evidence collected from recent studies has shown the benefits to customers using microfinance institutions has been less dramatic than expected. According to a series of six trials aimed at understanding various impacts of microloans on customers, changes in the income and consumption levels of borrowers have been minimal. On the flip side, positive influence was recorded in the areas of occupational choice, consumption choice, business scale, female decision-making power, and risk management. Does this Mean That Microfinance Has Failed? Given these moderate results, one could decide to write out microfinance as a viable business, but this would be a hasty decision, and maybe even a mistake. The microfinance business model is not necessarily a failure. We need to consider the costs incurred versus the benefits, specifically if the costs are small and the returns modest. This will enable us to assess the model in a different and more accurate light. While the benefits to borrowers may be slight, they are part of a broader ratio. If the costs are also minimal, a central premise of microfinance, the benefits may be better than they seem at first glance. Data collected from over 930 microfinance institutions that provided services to 80 million customers in 2009 showed that there was no unified business model adopted by all. Instead, there was a variety of approaches employed by the different providers. The NGO chartered organizations, for example, typically offered smaller loans that had a higher cost per dollar and attracted higher interest rates than those chartered by banks. Additionally, their loans usually targeted poorer borrowers, they lent more to women and dealt with harder to serve clients than banks and NBFIs (non-bank financial institutions). But despite the diversity in business model, and while levels of subsidy varied, the cost of lending was high for all types of microlenders. In conclusion, financial support remains vital across the microfinance sector. May it be in the form of public donations, state subsidy or private investments, it is currently inherent to the business model. Yet, if one takes a close and prolonged look at the findings of this research, they become less alarming and more challenging. Clearly, microfinance has a positive social impact, and it has problems too. It is crucial to keep iterating its business model, and cost structure to improve borrower benefits and lender independance alike. Microfinance institutions serve a purpose, but the business model is not always the most profitable. We look at the pros and cons of their existence. I have a friend has serviced by Microfinance. His life has changed one hundred percent. He has a successful business now. I think the Microfinance will change life of many persons. It is true that micro finance is the one of the best ways to fight with poverty. It will do wonders in the poor countries. Thanks for sharing this informative article. There is a Way Out of the Poverty Trap and It’s Called Inclusive Finance. so it is possible. This article can really teach you about Microfinance Model. It really helped me a lot. The article is worth informative and i have come to know about micro finance and even i think that micro finance is one of the best way to eliminate poverty. really useful article. To reduce poverty Micro-finance is a one of the best way. thanks and appreciate for the article. This is very useful article for someone who wants to know more. With 80 to 211 million customers over a 4 year span, you’d think Microfinance would be successful. I was one of those 80 million in 2009 as I couldn’t find any help from a Commercial Lender for by business. I was quite thankful for this different approach to lending! A concise, yet penetrating, article on the subject of microfinance. Well recommended as a continuing read! Great article with useful information that I’ll definitely use! very intereseting article. a lot of useful information for inquiring minds! 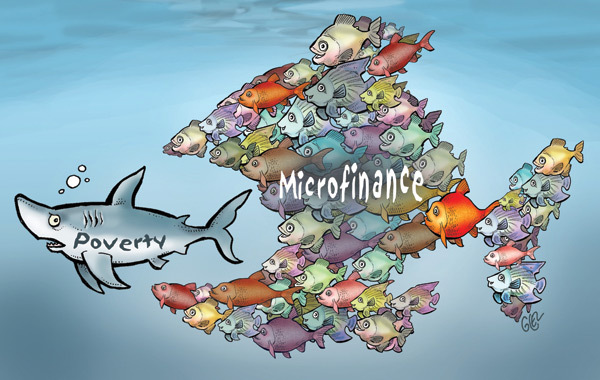 Micro Finance does play a good role in alleviating poverty. Your model on Micro Finance is amazing. It’s really a outstanding success in the field of Finance and Banking. doubt to the thousands of people it’s been helping. Supporting the poor financially. This is a deeply complex interpretation of an important business model and nails home the pros and cons. Great article! I feel that microfinance has helped sustained many Americans. It has also helped empower entrepreneurs and transform communities around the world. The authors, after going through a sophisticated analysis of data about Microfinance and published knowledgeable article. Micro finance has been discussed at length by the author of this article. The insight given about the subject analysis s indeed worth a praise. Exceptionally fascinating article. a considerable measure of helpful data for inquisitive personalities! Small scale Finance plays a decent part in easing destitution. Your model on Micro Finance is astounding. From reading this article, I have learned that micro finance is an excellent option for business owners. It has helped to empower so many people that might have difficulty if the option to micro finance did not exist. Very effective model to improve micro finance condition.This model is so helpful. Indeed, microfinancing has great role in the growth of new businesses..
That’s a great idea ………was nice reading your article. The pros of this probably outweigh the cons. It probably has some benefits. Microfinance seems to be a positive move. Great article- informative data as well. Always enjoy reading Mr. Perl’s work. An interesting view point on micro finance! Thanks for sharing. A well written article about Microfinancing. I learned a lot from this, thank you! Excellent article. I learned a great deal from this. Microfinance definitely has a future and should not be written off so easily. Honestly,micro finance is the the best way to overcome the poverty,and easy to understand the information thank you sir. What a nice video . keep up the good work . It’s so nice to know that a person like you help lots of people have a better life. You are one of God’s favored worker here on earth. Keep on helping people out! U are doing a great work. I feel really knowledgeable after reading the article.Cheers!! micro finance seem like the future of the finance world. The article is easy to understand and well written even for people with no background in this subject. Very informative article and clear read. Thanks ! Nice video. i enjoyed this video all situations. this will make more fun. Financial support undoubtedly remains vital across the microfinance sector, as well as many other financial-related sectors. I find the microfinance sector to be particularly important, given its role in serving the overlooked communities of people that the commercial banking sector does not. It makes sense that microfinance is undergoing rapid growth, and I would never second-guess the innate power of support, be it financial or otherwise. Good write-up! Microfinance has a chance to succeed.